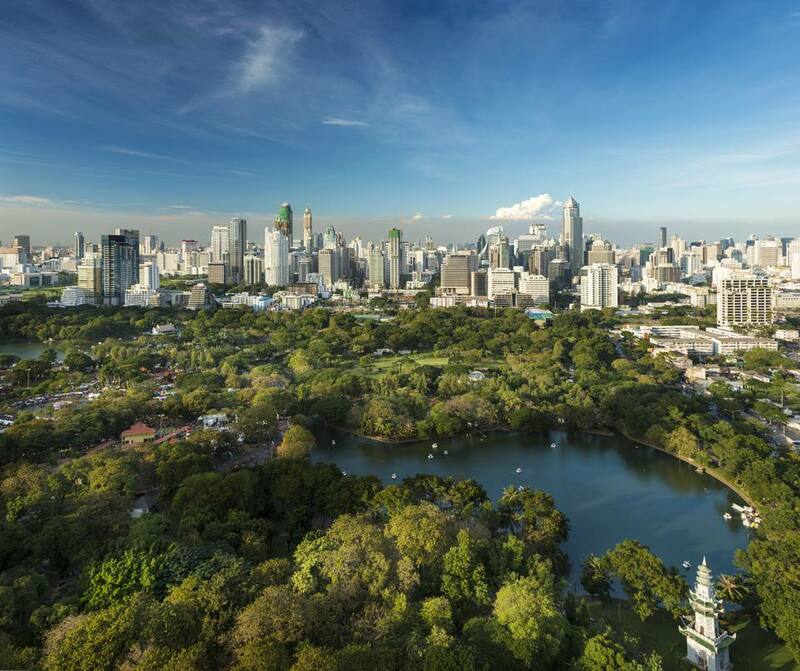 Bangkok’s Lumpini Park (pronounced “Loom-pee-nee”) is a pleasant, 142-acre space in the heart of Thailand’s capital. Any urban green space is to be cherished, but even more so in a busy city of over 8 million people! Lumpini Park serves as a needed respite from the hustle of Bangkok’s streets and sidewalks. It’s a place where people can sit, exercise, or check out some of the many activities on offer every day. But Lumpini Park is more than just an inexpensive diversion. The space is home to a number of permanent facilities and seasonal activities. Locals and tourists alike are drawn to the park for things to do beyond just lounging around on sarongs. Lumpini Park gets its name from Lumbini, the birthplace of Siddhartha Gautama (later to become Buddha) in Nepal. The space was set aside from royal land in the 1920s and then later turned into the first park in Bangkok. It is still the largest in the city. Thailand was invaded by Japanese forces in 1941 during World War II. Japanese soldiers actually used Lumpini Park as a camp, after which Allies bombed the city. The statue of King Rama VI, the king responsible for creating the park, was erected in 1942. Lumpini Park is centrally located in Bangkok. The quickest way to get there is by train unless you’re coming from the Khao San Road / Soi Rambuttri area, a tourist-oriented neighborhood where no BTS or MRT lines reach. Most of Lumpini Park is surrounded by walls. You'll need to enter through one of the six gates. The main entrance is arguably the one in the southwestern corner near the royal monument and MRT station. By Train: The Silom MRT station (Blue Line) is located in the southwestern corner of Lumpini Park. The Lumpini MRT station is at the southeastern corner. The nearest BTS (skytrain) station is Sala Daeng, just a little south of Lumpini Park. Sala Daeng is located along the BTS Silom Line. If you’re coming from the Sukhumvit Line, which is often the case, you’ll need to change lines in the Siam BTS station. From Khao San Road: Lumpini Park is around 90 minutes of hot walking from the Khao San Road area. Going by taxi is easiest. Some drivers will refuse to use the meter; if this happens, simply flag another. If you’ve never taken a tuk-tuk ride in Bangkok, now’s your chance! Just know that tuk-tuks are typically more hassle, less comfortable, and no cheaper for tourists than a metered taxi. You’ll need to negotiate a fare with the driver. Don’t agree to stop at any shops along the way; this is a classic scam. Going somewhere in Bangkok by tuk-tuk may involve bonus hassle, but doing so at least once is a rite of passage for visitors! Park hours are from 4:30 a.m. to 9 p.m. Smoking is prohibited throughout the park. Tourists are frequently caught and fined. Don't do it! Cycling is banned after 3 p.m.
Wi-Fi can be found throughout the park, but signal strength varies. Use it with care as you would any unsecured public network. Sleeping in the park isn’t permitted, although you could probably get away with a nap. Excessive displays of public affection are generally frowned upon in Thai culture. Too much cuddling can cause locals to feel embarrassment. Food carts are dotted throughout, with the highest concentration clustered around the main entrance in the southwest. For more local-oriented choices, check out the vendors selling treats along the northern border of the park. Many carts cater to the morning fitness crowd. Depending on how much business they received in the morning, many vendors may be closed by noon. The giant monitor lizards that call the lake home may look like Komodo dragons but thankfully aren’t dangerous. They are, however, in the same family as their venomous cousins and can have a nasty temperament when cornered. The Thai word for these lizards (hia) also serves as a profane insult. In other words, it’s best to leave them alone. For years, the monitor lizards in Lumpini Park have grown in size and audacity, both attracting and spooking Western visitors. In 2016, the government relocated approximately 100 large lizards, however, hundreds were left behind. The lizards are a part of the ecosystem serving as scavengers who clean up dead fish, birds, and other creatures. Although the monitor lizards aren’t dangerous, they do grow to frightening sizes — some are close to 10 feet long! For obvious reasons, you shouldn’t attempt to feed or interact with them in any way. Although the 142 acres (57.6 hectares) of park are generous, an estimated 15,000 people pass through daily. Don’t expect to have very much privacy. Along with permanent attractions such as an outdoor gym, indoor dance hall, and library (Bangkok’s first), a number of groups meet in the park to share activities. Weekends are particularly eventful, and most clubs meet in evenings when the heat is more tolerable. Early mornings are especially busy as people come to exercise. Jogging two circuits of the park is roughly the same as completing a 5K! Exercise: You can jog, cycle, and rollerblade in the park, but on any given morning or evening, you’ll see groups who gathered for tai chi, Zumba, aerobics (between 5 and 6 p.m.), and even break dancing. These activities are typically free to join. Rent a Boat: Ever wanted to ride along with your significant other in a tacky, giant swan? Here’s your chance! Row boats are also an option. Meet People: Many varied interests bring groups together in Lumpini Park. You can take advantage of an opportunity to meet locals and participate. You’ll see clusters of people from local bird-watching clubs, photography clubs, and even Pokemon hunters. Students may shyly approach you to practice English. Enjoy the Music: During the dry season (winter months), the orchestra plays free shows on weekend evenings. At other times, you’ll catch different types of music and even karaoke. All are typically free to enjoy. Participate in park karaoke sessions at your own peril. Erawan Shrine, Bangkok’s famous sidewalk shrine, is just a 15-minute walk north on Ratchadamri Road, the main road that forms the western park boundary. Lumpini Park is encircled by numerous cafes and places to eat if you don’t wish to sample the food stalls. MBK and Terminal 21, two large shopping malls with food courts and abundant shopping, are an interesting 30-minute walk away. Going by MRT requires about the same amount of time. Also near Lumpini Park, you'll find health spas, a Geological Museum (due east from the park), and even a snake farm (on Rama IV Road). The Bangkok "CityCity" Gallery is a 10-minute walk south of the park.